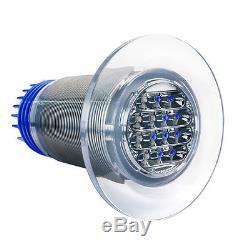 18 Tri-Series Gen 4 Underwater Light Blue/White The colourful Tri Series is all about offering choice. The Tri Series combines the brilliance of the blue and white with the body of the 12 and 18 Series and offers customers the choice of two colors (9 blue and 9 white LEDs) in the one housing. Choose to operate just one of Aqualuma's famous light colors, or run them together to get a mix of the two, at an intensity that is equal to the 18 Series. Manufactured in the incredibly robust one-piece, corrosion-proof and injection-molded polymer housing. High-Tech chemically resistant polymer housing. Low dc current draw, 12 or 24VDC. 2 colors in the one unit can be run individually or together. Can be operated in or out of the water. No bonding to anodes required. Throws both a deep penetrating and wide flat beam of light from the one unit. Combination optic with increased horizontal spread. The item "Aqualuma 18 Tri-Series Gen 4 Underwater Boat Marine LED Light Blue/White" is in sale since Thursday, June 23, 2016. This item is in the category "Consumer Electronics\Vehicle Electronics & GPS\Other Vehicle Electronics". The seller is "happy_iguana_inc" and is located in New Jersey. This item can be shipped to United States, Canada, United Kingdom, China, Mexico, Germany, Japan, Brazil, France, Australia, Denmark, Romania, Slovakia, Bulgaria, Czech republic, Finland, Hungary, Latvia, Lithuania, Malta, Estonia, Greece, Portugal, Cyprus, Slovenia, Sweden, South Korea, Taiwan, South africa, Thailand, Belgium, Hong Kong, Ireland, Netherlands, Poland, Spain, Italy, Austria, Israel, New Zealand, Singapore, Switzerland, Norway, Saudi arabia, Ukraine, United arab emirates, Qatar, Kuwait, Bahrain, Croatia, Malaysia, Colombia, Panama, Jamaica.